Mertesacker, Jenkinson, Koscielny, Cazorla, Ramsey, Diaby and a very respectable point. 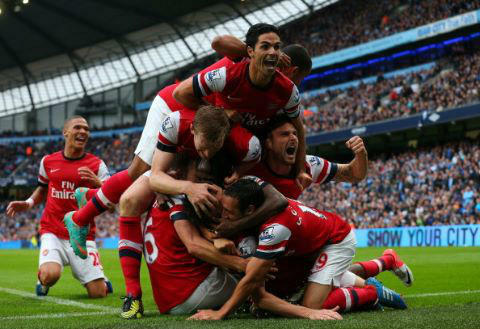 Manchester City 1-1 Arsenal: Pile on! I’m writing this just after the game has finished, and scheduling it for today. I’m fairly certain I suffered several heart attacks during the final 10 minutes of that game; one notably brought about by elated yelps, and one through the horror of nearly conceding to a Kompany bicycle kick. If you’d asked me yesterday if I would have been satisfied with a point, I would have swiftly replied with a resounding, “yes!”. Now the match has finished I’m very pleased with coming away from the home of the champions with a point, but slightly disappointed, too; with a little bit of composure and a bit of luck, three points where there for the taking. In the first half we were much the better team; our cohesion was good and we looked to have a fluidity and shape about us. The defending for the goal might have been a momentary lapse into the Arsenal of old, but on the whole I thought we looked very good. Cazorla played with his usual brand of zippy imagination, Ramsey looked hard-working and confident. Arteta was as solid as always. Perhaps Diaby wasn’t as good as he has been in recent weeks – once or twice he was caught asleep on the ball. The second half saw us drop off a little, but the most pleasing thing for me was Arsenal looked like a team. The players worked hard for one another with industry and commitment, and the reward we deserved came when Koscielny rocketed the ball home from a corner. When that went in, you could see the unity in the players from the celebrations – just take a look at the footage, or the picture I used underneath the title of this post. The only downsides were the concession of a soft goal – aside from that blemish, the back four were excellent – and Gervinho’s frustrating side rearing its ugly head once again. He’ll be lambasted in many circles for his performance yesterday, but not by me. Sure, he is incredibility frustrating and unpredictable, but his head never drops and he’s always trying to make things happen. I like him, and I think he’ll contribute far more good than anything else this season. My MOTM award would go to Per Mertesacker, who showed that a footballing brain and intelligence is important in a defender above all else. He read the game brilliantly and along with Koscielny and Vermaelen, we are looking to have some excellent options at the back – special mention should also go to Carl Jenkinson who put in another solid turn. Things are looking good, and with Wilshere, Rosicky and Sagna to come back, our depth looks increasingly positive. It’s certainly early days yet, but yesterday showed we can mix it up with the favourites, and if we keep this form going, we’re going to be a threat to anyone. That’s all for today. Did you enjoy the game? Do you think we could have taken all 3 points? Did Gervinho make you want to bang your head repeatedly against a wall? The comments are below, let me know your thoughts. Walcott isn’t going to sign a new contract. Solid performance from the lads. AW should mould or find a clinical finisher becuase if we had one in yesterdays game,we would have won the game by not less than three goals..However,the ball is in our hands this season. Jenkinson for me deserves special praise, from the little boy that needed special protection a few months back to a man oozing a fantastic drive and confidence..thumbs up ! Of Mertesacker you are spot on, he looks like he laboured when he is running but his sense of position and timing for just about anything required of him is just fantastic. Amazing we have such depth of talent at Arsenal and am sure the rest of the league is beginning to notice that. One wonders why some players would be leaving thinking football is played somewhere else when its clearly played at the Emirates Stadium !! Ramsey was MOM. He filled in wide until a limp Diaby went off and then moved to CM to run the midfield as Arteta and Cazorla ran out of legs. he moves and finds space like Fabregas and is even more tireless. When he and Jack get together……..